First, thanks to Wintahaba for mentioning George's in a different thread. 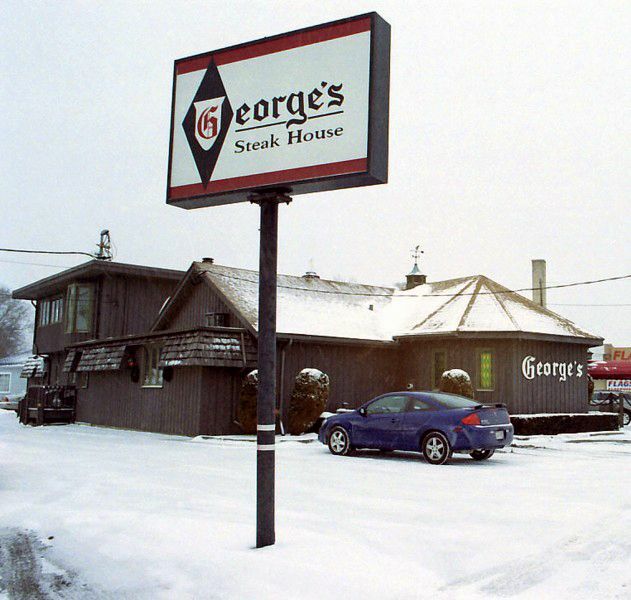 Awhile back I was up in the Fox Valley on a Friday and since I was going to be in the Appleton area around lunch I decided to check out George's Steak House. 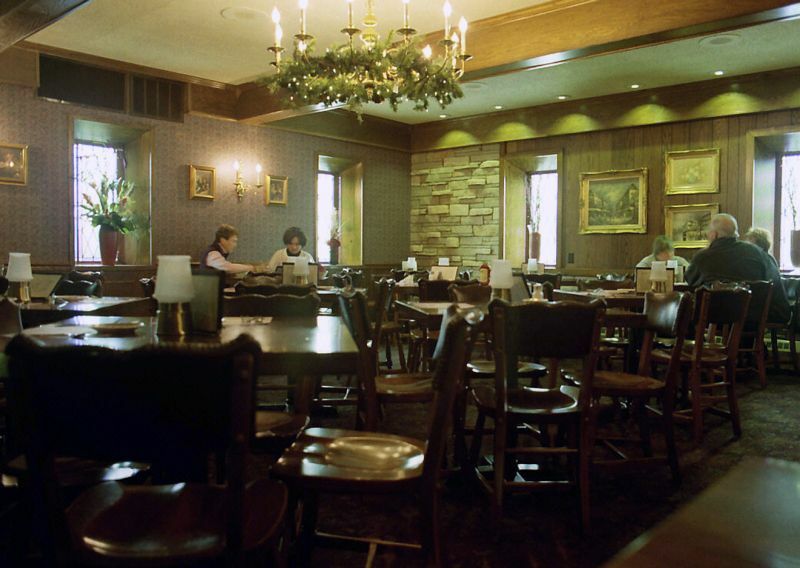 It's been around since the 1930s (and was a roadhouse/tavern prior to that) and is consistently popular in the area. 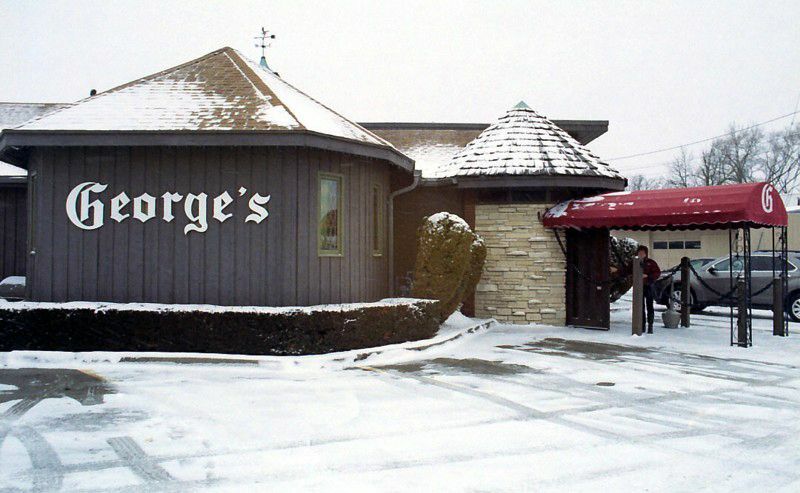 George's is dark inside. Dark as in "I can't see a darn thing" when you first go in and "Is this a nuclear test site?!?" when you go back outside. The piano bar was deserted at 1:30pm. 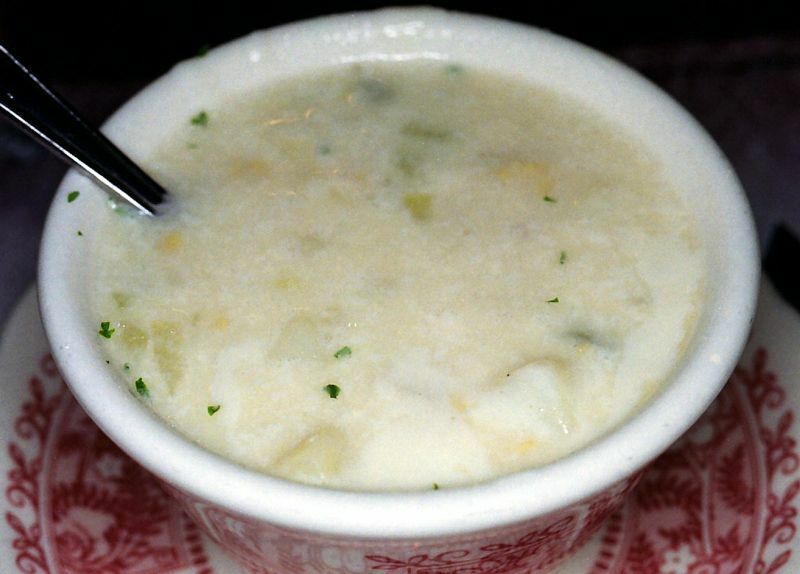 Since I had steak on my mind I was hoping for French onion soup but it wasn't on the menu, so I chose the clam chowder instead. It was thinner than others I've had but the flavor was very good and it had plenty of clam pieces. 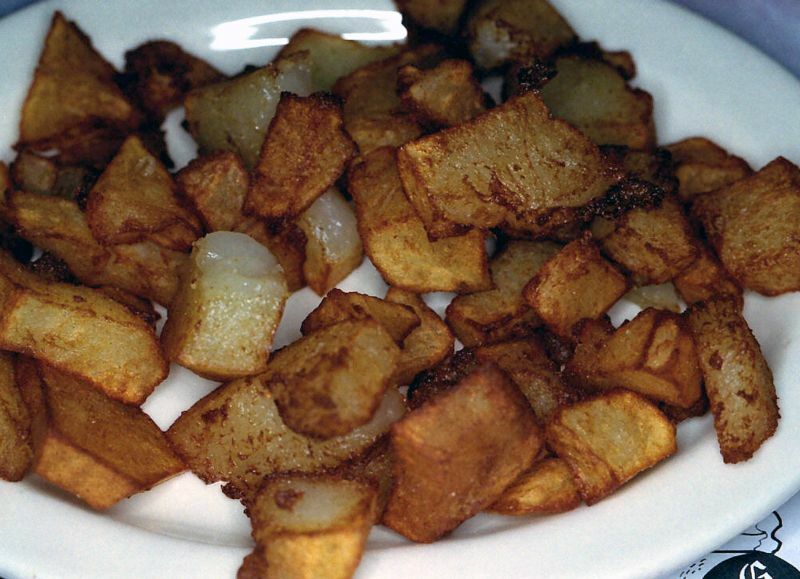 Baked potatoes are a dinner item for me and I didn't feel like having french fries, so American fries won. They were nicely done and not greasy. It was a tough call between the ribeye and the top sirloin so in the end I opted to save a couple of dollars and went with the sirloin. 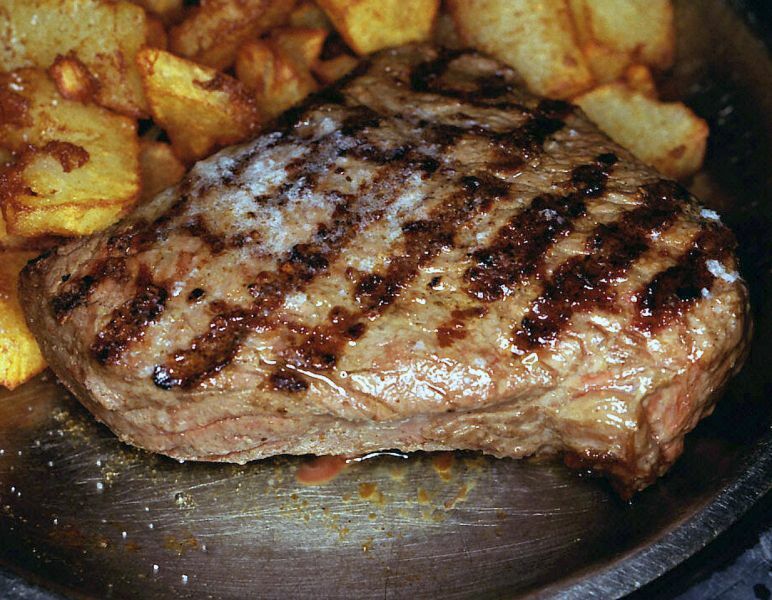 George's adds the traditional touch of butter to the steaks, too. I like my beef rare and George's didn't disappoint me. 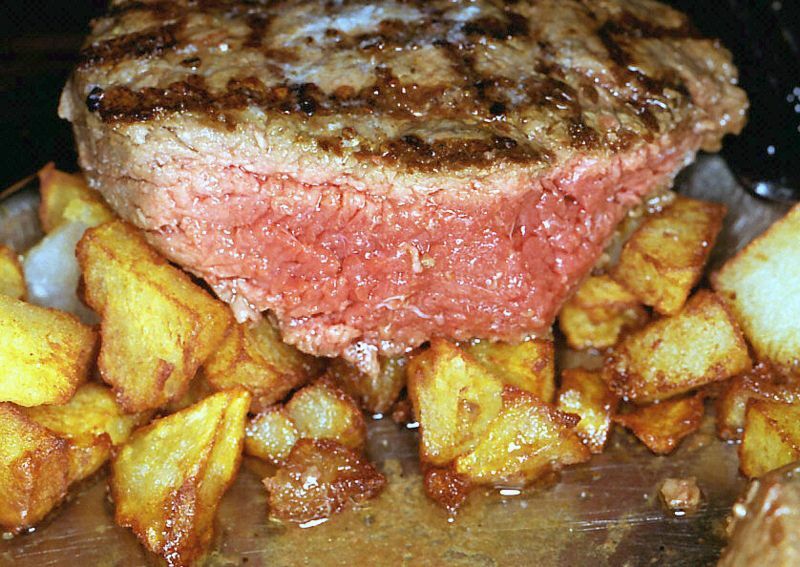 The sirloin had a nice beef flavor and the expected in-between texture that I expect, and the meat juices were perfect on the potatoes as well. And not only was the food very good but the bill was quite palatable as well: $21 out the door, including tip! Wow SC, you get around! I also enjoyed your Iowa trip write-up. I'm planning a long solo motorcycle trip out West this summer and plan to hit the pork cutlet places on the way home. Already have second day lunch planned at Nick's in Brookings, SD. SC, I am really happy you enjoyed it. 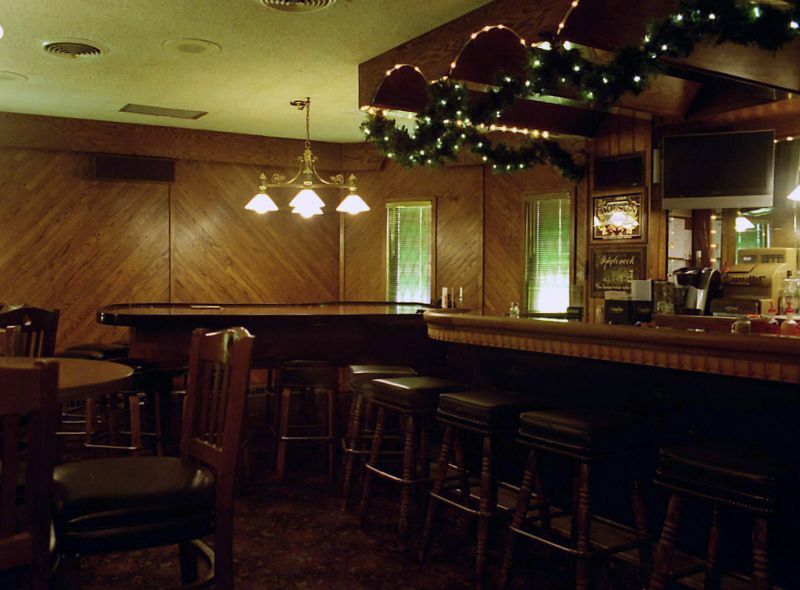 For some reason the piano bar looks different at 10:00 PM. Thanks again for the tip! I looked up a number of the places that you mentioned but only a few serve lunch, so hopefully next year I'll be able to try someplace different. I had finished lunch and was getting ready to leave when my server asked me a rather curious question: "Are you from Channel 5?" As it turned out the station had scheduled a visit by a reporter and videographer that afternoon and when Gale saw me using a camera she not unexpectedly wondered if I was somehow involved. And then when I stopped in the bar to pay my bill and get a couple of shots the manager asked me the same question! And then when I stopped in the bar to pay my bill and get a couple of shots the manager asked me the same question! El Tesoro de Don Felipe? Nice to see a write up of a place close to me. I havent ever been there but I shall have to try it soon.